PPC's Guide to Divorce Engagements provides useful guidance on the CPA's role in a wide range of divorce-related areas, such as alimony and child support discussions, marital property negotiations, forensic examination services, tax planning and compliance work, and post-divorce issues. 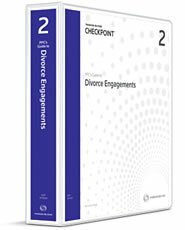 The Guide introduces a logical, step-by-step engagement approach to providing divorce services (including examples and case studies illustrating how the practical guidance can be applied to "real life" engagements) and contains easy-to-use practice aids that have been specifically designed to increase the effectiveness and efficiency of each divorce-related services engagement. The Guide is updated annually for the latest relevant tax legislation and professional standards.